Almost 112,000 votes were registered on the LuckyGunner site for distribution of the $112,000 given away as a result of the victorious lawsuit. Through the combined efforts of many of GOCRA’s members and affiliate organizations, our 1836 votes have earned GOCRA $1834 to be put towards the protection of your rights! After the Aurora theater shooting, the Brady Center to End all Gun Ownership sued online ammo seller Lucky Gunner Ammo for selling ammo to the shooter. The judge however ruled in this case that the store won. Now the Brady Center has to pay all of the accumulated legal fees! LuckyGunner is donating all of the $111,000 that was won as a part of the settlement to gun rights groups across the nation. It will be divvied up based on how many votes each gun group receives. Please click the link and vote for GOCRA! 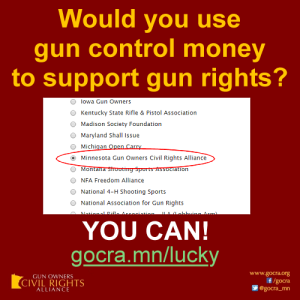 Right now, for every person who clicks through, about $2 is sent to GOCRA to continue fighting for and protecting the Gun Rights of every Minnesotan.